I have a question related to a pony pulling in harness. What would be the appropriate size of a stone boat for a pony that is approximately 12HH and 600 pounds? The size of the stone boat will not matter as much as the weight you put on it and the terrain/ground conditions on which it will be pulled. We have a wooden stone boat about 3′ wide and 6′ long that Cathy’s pony (about the size of yours) can pull easily with 50 to 100 lbs. on it over a hard surface or grass. He can pull it with greater effort loaded with 150 lbs. for short distances with air/rest stops in between pulls. In conditions like loose dirt, sand, mud, up hill, etc. it would pull harder with whatever load was on it. 1. What are they physically capable of pulling? 2. What are they psychologically capable of and comfortable pulling? In my experience most animals are physically capable of pulling more than they can handle psychologically. However, if we train and manage them skillfully they will get better and better at pulling – if we don’t they will go the other way. Always start with a very light load to test them out each time you work.Then gradually increase the amount they are asked to pull. In other words, warm them up and give them confidence before asking them for the heavier pulls. The most common mistakes people make are to ask them to pull too much before they are ready, and to pull them too far without a stop for air and rest. Repetition, repetition, repetition with gradually increasing loads is critical. If they get anxious or confused stop, calm them down, lighten the load (rather than removing it), and proceed when they are relaxed and comfortable. Lighten the load to a point where they can pull it and remain relaxed and comfortable as they work. Add weight in small increments to keep the equine comfortable and working in a relaxed way. Take care, stay safe, and enjoy those horses, ponies, mules, and donkeys! Here is a photo of Tom Triplett and Cathy’s Welsh pony Jay Jay, approximately the size of the pony Jeri inquires about. Jay Jay is a great cart pony and he also ‘pulls his share’ around the ranch by hauling loads that are suited to his size. 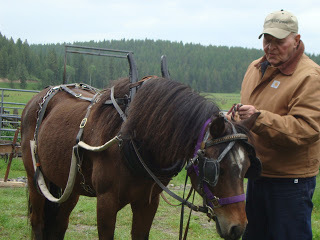 Here, he is dressed in the collar style work-harness Tom made for him (notice the antique wooden hames: some Tom’s father had used ranching in Montana in the 1900’s). Smaller equines, like Jay Jay and Jeri’s pony, can make great working contributions on your ranch or farm. Smaller equines are well suited to get into (and out of) some of those tighter spaces that are trickier for our larger equine workers. Previous Post"The Mind of the Horse" Doc’s presentation at SFJ 2012Next PostHorse Logging Workshop "Its Not ALL HARD work!"